SHF #13: Chocolate Mascarpone Tart - Do You Know The Muffin Man? This is my contribution to this month's Sugar High Friday, hosted by Kelli from lovescool, and the theme is dark chocolate. Finding a recipe that uses dark chocolate is never too difficult, but I looked through my cookbooks and nothing really appealed to me. I had a sizeable chunk left from a big slab of Callebaut bittersweet chocolate and some Cocoa Camino organic cocoa: what to make? Turning to the Internet, I stumbled upon Nick Malgieri's recipe for this tart. Perfect, since I had some leftover mascarpone and all the other ingredients. The crust is very simple as the food processor does all the work. After adding the egg to the dry ingredients, the mixture still looked sandy. As I gathered it into a ball, it came together, but a little on the crumbly side. I made the syrup, then melted the butter and chocolate pieces in it. As I whisked the mascarpone and eggs together, there were small lumps of cream cheese that I couldn't quite eliminate. When I stirred in the chocolate mixture, they looked like they disappeared but I worried that there would be white bits speckled throughout the tart! The chilled dough was difficult to roll out as it didn't quite stick together. Since the amount fit a 10" pan perfectly without much scraps, I had to make sure not to roll it too thin. As the crust and filling baked, both puffed up a bit. After letting it cool overnight, I melted some milk chocolate and streaked the top using a small Ziploc bag. Some Kahlua-flavoured lightly sweetened whipped cream completed the dessert. 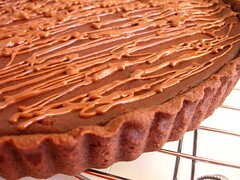 The tart resembles a cheesecake without the tanginess and smoothness. The crust is a bit crumbly and dry. All in all, it was pronounced quite delicious by my tasters. That's just another example of how anything made with dark chocolate is usually a success!